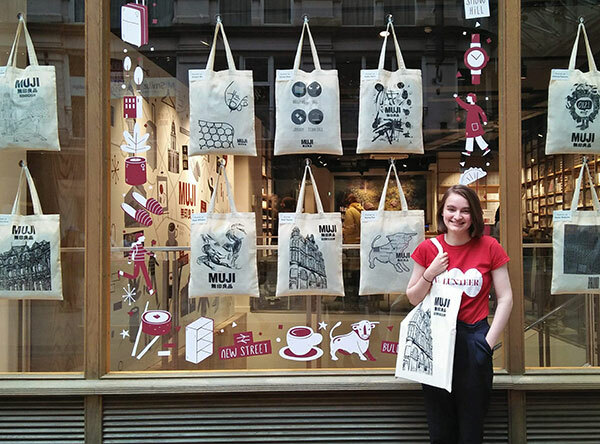 BA (Hons) Graphic Communication student, Ruth Yeates has won the MUJI Birmingham Tote Bag Competition, winning her beautifully designed bag a space in the shop window and a section in the shop where they are displayed and sold to the public. 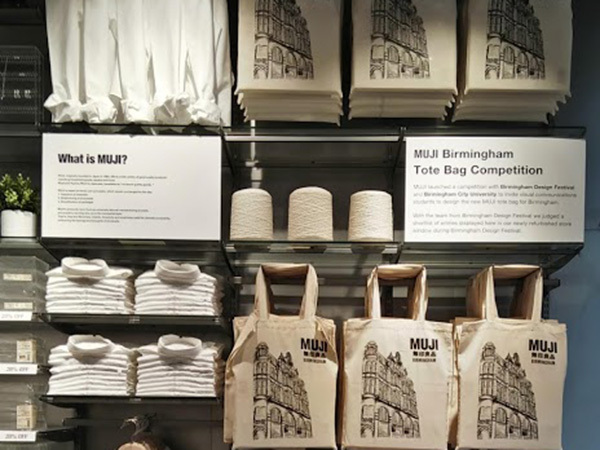 The competition was launched to celebrate the reopening of the New Street store and on occasion of the inaugural Birmingham Design Festival. The design of the bags was open for interpretation as long as it represented the culture of Birmingham in some way. Ruth’s response to the brief was directly linked to the MUJI store and the building hosting it on New Street, Birmingham. I aimed to create a simplistic and minimalistic design which portrays the nature of the MUJI store and its products. 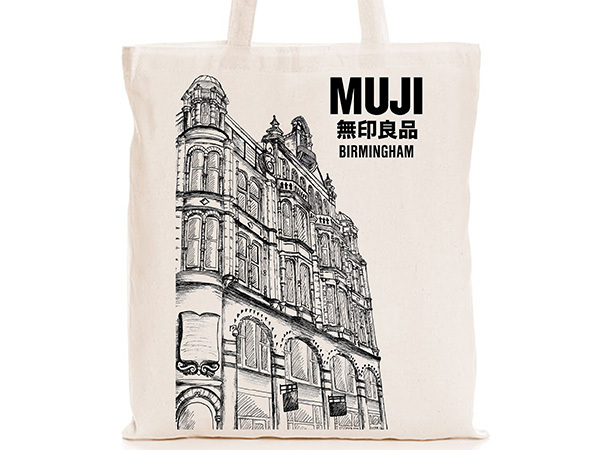 I was inspired by the beautiful heritage of Birmingham and the lovely features of the buildings on New Street, including the building the MUJI shop is in. 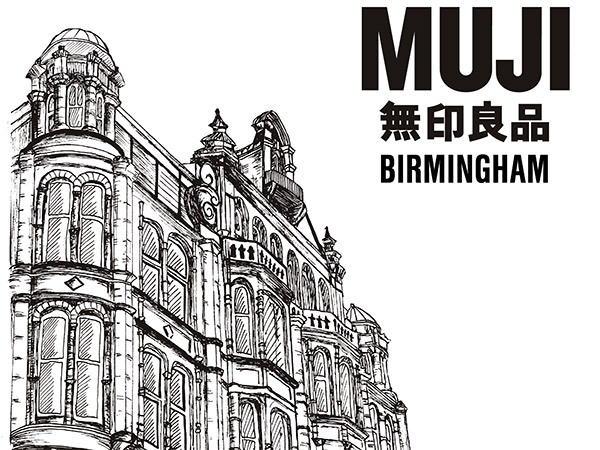 Ruth’s final design was a pen line drawing of the Birmingham MUJI store building, created using MUJI pens and stationary. Ruth decided on her final piece to contribute to the marketing of the shop by showing its location and highlighting the beauty of the architecture and heritage around it. The competition was entered by around 40 people and the winner was chosen by the Marketing Team at MUJI. Ruth’s bag was joined by those of 10 runners up and they were all displayed in the shop window. 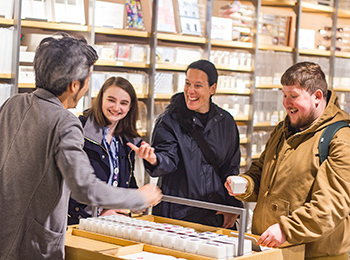 As part of the prize, Ruth met the head of Design and Marketing, and a Graphic Designer from MUJI to talk about the brand and their work in the industry. I wasn’t at all expecting this to happen! Competitions like this are CV worthy and a great way to get your work out there for people to see and make connections with the creative industries. It’s been an amazing experience for me!